For over 80 years, Don’s Seafood has been serving up fresh local seafood and Cajun favorites at locations throughout South Louisiana. Now, you can experience the same authentic cuisine you love at home, work or wherever you are with our takeout menu. Contact our Covington, Denham Springs, Gonzales, Hammond, Lafayette or Metairie restaurant to place an order for seafood takeout. Gather your family around the dining table and give them a taste of authentic Cajun fare with one of our appetizers. 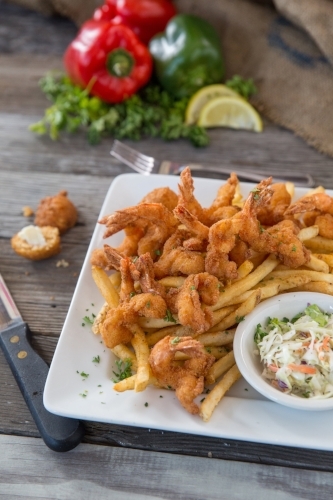 Serve up fried or broiled shrimp with our Zydeco Shrimp or Don’s Original Jacked Up Shrimp™. For a fun twist on a traditional dish, order Seafood Spinach Dip, which blends together spinach, shrimp and crabmeat. Fried Alligator, Fried Crab Claws and Hush Puppies are also available to help warm up your palate. And don’t forget to try Don’s Original Jacked Up Oysters™, which feature oysters on the half shell that are charbroiled with bacon, jalapeños and pepper jack cheese for an irresistible combination of salty and savory flavors. Don’s Seafood is known for our mouthwatering seafood dishes. For your next meal, consider one of our specialties – like Don’s Seafood Platter. This shareable dish comes with stuffed crab, fried shrimp, stuffed shrimp, fried catfish, fried oysters and shrimp étouffée. Fried Shrimp, Fried Catfish and Fried Oysters are also popular specialty dishes. If you’re feeling a little more hands on, select from our delicious array of sandwiches. The Shrimp Po Boy takes fried shrimp and adds it alongside lettuce, tomato and tartar sauce to French bread. We also offer a Cajun twist on tacos and quesadillas with our Crawfish Boil Quesadillas, Zydeco Shrimp Taceauxs and Grilled Shrimp Taceauxs. Straight from the grill, you can enjoy Cajun Ravioli covered in our Louisiana crawfish cream sauce or Blackened Shrimp Pasta paired with Alfredo sauce. Classic American entrées, such as Grilled Chicken Breast, Ribeye and Filet Mignon, are also available and cooked to perfection. Don’t forget to pair any entrée with a cup of gumbo or our delectable sides. Take home your favorite Cajun cravings from Don’s Seafood when you order from our extensive takeout menu. Call your nearest Don’s location, or order online through Waitr.